Arai say it's the most authentic limited edition Joey Dunlop replica helmet produced using the actual design and sponsors from 1985. The helmet will be a Celebration of Joey Dunlop's success throughout his racing career, particularly the 1985 Isle of Man TT Races where Joey had three first place finishes; the ‘Junior TT’; the ‘Formula 1 TT’ and the Blue Riband ‘Senior TT’. Joey also had three first places at the Ulster GP and two at the NW200 in the same year. 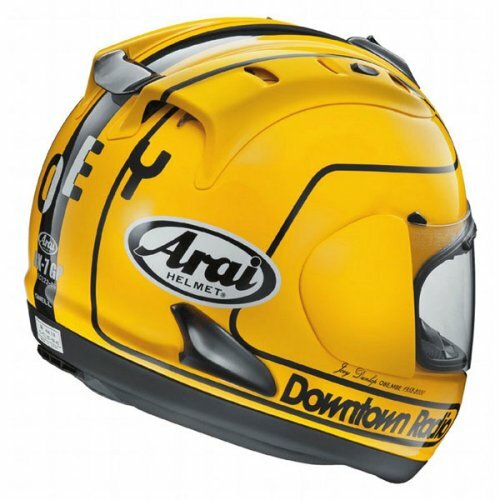 The design prominently features Northern Ireland radio station DownTown Radio who sponsored Joey during 1985 and had the radio station logo on the side of his iconic yellow and black helmet. The ‘Joey 85’ is the most authentic replica to date with a simple ‘Joey’ on the back as per his helmet of that year. The helmets are due to arrive at the end of July 2014 and thevisorship.com will dispatch orders in the sequence they are received. It is anticipated that the helmet could sell out in pre-orders alone so thevisorshop.com is taking advance orders now with full payment. The helmet comes with Clear Visor, cloth helmet bag and pin-lock anti-fog insert. The helmet will also be on display at this year's Classic TT Races presented by Bennetts, which will feature a display of 25 authentic machines raced by Joey Dunlop in his 24 year career including a number of his Isle of Man TT winning machines. The 80's themed Classic TT Festival will also include a parade lap - 'Joey Dunlop Road Racing Legend - The Rivals’ sponsored by the Isle of Man Steam Packet Company featuring many of his closest competitors. “We are delighted to be entrusted by Arai as the Sole European Retailer of this new Joey 1985 Classic Replica. Crossan’s has a long association with the Dunlop family through knowing Joey and Linda personally and also having been Robert's main sponsor for many years. We also sponsored Michael at the beginning of his career. Crossan’s also have a long association with Arai Europe and UK stretching back almost 25 years." “I am happy that the new Arai has come about, it looks great and I know that Joey’s fans from around the world have been looking for another replica to be done by Arai. It keeps Joey’s memory alive. I am also happy that Northern Ireland company Crossan’s TheVisorShop.com are taking care of the sales and mail order of the new helmet."